This morning I brought the two little ones with me to get the oil changed on our mini-van. I have learned that the best thing to do is to turn it into a fun and special event by getting donuts for them to enjoy while waiting. This starts the wait off on the right foot with happy kids! My experience hasn't always been sugary nice while getting the oil changed, however. I had completely forgotten about one of my most glorious moments as a mother that happened to occur while I was waiting for the car at the dealer!! 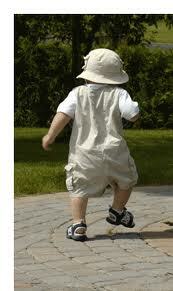 Tyce was just a tiny guy, wobbling around on his stocky legs in his diaper. I was waiting for something on the car to be fixed. Of course Tyce decided to fill his diaper while we were there. I took him to the bathroom with the rest of my crew in tow only to discover that I wasn't prepared for the situation! My diaper bag had wipes and all other kinds of goodies in it, but not one diaper! How in the world could I be out of the house without a diaper? I know you get a little more relaxed by the time you have your third child, but no diapers??? Ridiculous!! If his diaper had only been wet we could have gotten away with waiting until we got home, but at this point the diaper was off, the bottom was clean and bare, and there was nothing in my bag of tricks to soak up the inevitable! Time to look for some options! Toilet paper was plentiful, but not all that absorbent. I opened up the supply closet in the restroom and scanned my other choices. 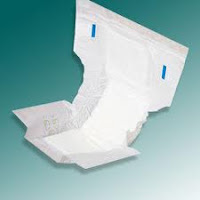 I found the only alternative available, asked my small son to forgive me, and fashioned a feminine napkin in my baby's pants to try to cover what a diaper would have! Do you know how hard it is to make a curious toddler sit on your lap and not run around a new place!? I held my breath waiting for the pad to fall out of my child's pant leg! The horror of it all still comes back to haunt me!! How I Roll.. or Crawl..
Day in the Kitchen Part II - the sweeter side.. The Messier, the More Fun?